Touch Notes iPhone App Review. Free iPod Touch Apps, Today I have got a chance to review the note taking iPhone app called Touch Notes and you would like this too. Many at times, we may have forgotten the ideas/todo things because of not taking any hints. The moment when i have looked at this app, I have got a feel that this iphone app would certainly fulfill the need of users who is willing to take notes in different ways. Touch Notes is very simple and intuitive interface to note down all the important ideas/todo. 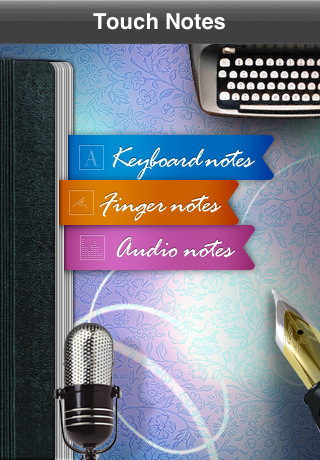 You can notes in three different modes such as Keyboard, Finger and Audio notes. If you feel like taking notes through keyboard would be more comfortable than the other two, you can do so. If you do not have take enough time to take notes using the keyboard, you can have audio notes to record your voice and you can play back whenever you wish to hear the notes. Really amazing. I am really impressed with this audio note taking feature because I feel more comfortable in taking audio notes. Moreover, this touch notes app for iphone would improve the productivity in accomplishing the tasks. I would certainly recommend that Touch Notes iphone app is a suitable note making app for the iPhone. It is available for $0.99 at the App Store and it is compatible with iPhone, iPad and iPod Touch. Download Touch Notes iPhone Here!